I really AM okay with this… ya gotta play to win, right!? Any you keep playing and driving hard and finding your voice and submitting and driving hard and resubmitting and … remember the 9 steps to being a winner (see Little Miss Sunshine if you don’t recall). And you’ve got to love it! It is an intimate part of being a writer! Congratulations! 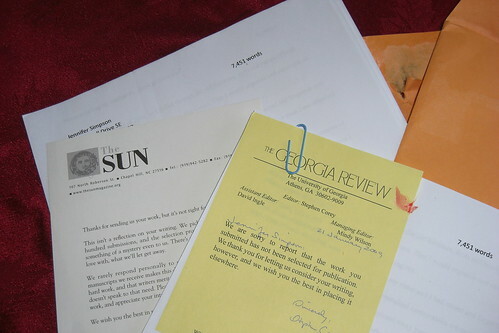 And so the rejections pile up. But every once in a while, submissions lead to acceptance. Hey, that’s exciting. I’ve heard you have to get a bunch of those out of the way before the other stuff happens. I know, being a visual artist, that rejection is just part of the deal. Not everybody can like everything. That’d be boring, or something. I’ve only ever received the rejection notices for writing… because I gave up on it so long ago. But I am excited to retry now! PS Do you recommend wordpress for a blog hoster?